An Egyptian army vehicle outside Cairo University on December 10, 2013. The institution was closed early due to unrest., a photo by Pan-African News Wire File Photos on Flickr. Army chief and Minister of Defence Abdel Fattah El-Sisi said Thursday that Egypt will stand still in the face of "terrorism" and that the Egyptian people will never feel fear as long as the Egyptian army exists, Al-Ahram Arabic website reported. El-Sisi, in a speech given at a graduation ceremony for non-commissioned officers, urged attendees not to let recent terrorist attacks dampen their spirits. On Tuesday, a bomb exploded near a security directorate in the Nile Delta city of Mansoura, killing 16, mostly security personnel, and injuring more than 135. El-Sisi said that the "freedom and stability" that the Egyptians seek will not come by easily, and that Egyptians have to "put their trust in God, the army and the civilian police to take Egypt to freedom, stability and progress." "There's no reason to fear or worry, the Egyptian army will sacrifice itself for Egypt and Egyptians, and those who harm you will vanish from the face of the earth," he declared. El-Sisi's speech came on the same day a bomb exploded in Cairo's Nasr City district, near a bus, injuring five while another bomb planted neaby was defused by interior ministry explosives experts. 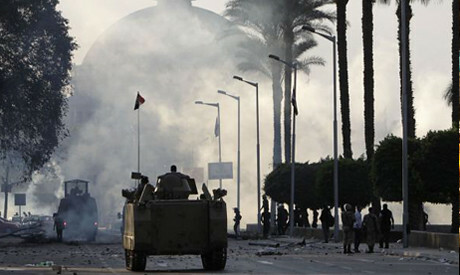 The interim government blamed the Muslim Brotherhood for the incident despite the Brotherhood's denial of any involvement. The government officially announced Wednesday the Brotherhood a "terrorist group." Ansar Beit Al-Maqdis, an Al-Qaeda-inspired Islamist militant group, claimed responsibility Wednesday for the deadly bombing in Mansoura. The Egyptian army has been waging an intense "anti-terrorism" campaign in the past five months aganist armed Islamist militants in Sinai. Jihadists have intensified their attacks army and police checkpoints in Sinai since the ousting of Muslim Brotherhood president Mohamed Morsi on 3 July.